Staying at a Rosen Inn at Pointe Orlando and interested in visiting a theme park? Our Universal Partner Hotel Vacation Planning Center can help you with theme park ticket purchases and reserving a seat on our shuttles that services most theme parks. Ask your agent at the guest service ticket and attraction concierge desk for more details. 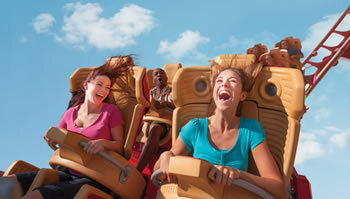 We also have hotel packages that include theme park tickets, further increasing your savings. 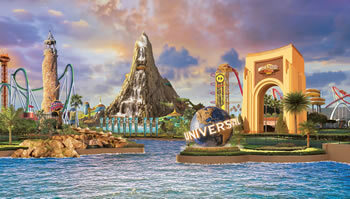 Visit the Universal Partner Hotel Vacation Planning Center** in the lobby for more details. The Vacation Planning Center is staffed with experienced Universal Orlando Resort™ Vacation Planners ready to help with ticket orders, redemptions and whatever else you may need to make your vacation extraordinary. Rosen Inn at Pointe Orlando offers guests free shuttle service between Universal Orlando Resort™ and SeaWorld® Orlando. Reservations for all shuttles are required and must be made in person at the Universal Partner Hotel Vacation Planning Center. Contracted groups traveling together are not eligible for the free shuttle. Call group sales toll-free 1-866-847-8585 for alternative shuttle recommendations. Listed below are the major Orlando theme parks close to Rosen Inn at Pointe Orlando. It’s the one place where the dining tastes of every member of the family and entertainment everyone can enjoy all intersect. Enjoy the best in casual and fine dining, live music, movies, shopping, miniature golf and more. It’s everything you’re looking for. And anything but ordinary. Universal CityWalk™, The Epicenter of Awesome. SeaWorld® Orlando is celebrating its 50th anniversary with new shows, more sea animal connections and a Sea of Surprises! The world’s premier marine adventure park has family-friendly exhibits, rides, and shows nestled in 200 acres, including thrill rides such as the Kraken®, Journey to Atlantis®, and Manta®. Complete your visit to SeaWorld® Orlando with an up-close visit with dolphins, orcas, beluga whales, and other sea creatures. Recipient of the 2014 Travel’s Choice™ from TripAdvisor®, Discovery Cove offers many once-in-a-lifetime adventures wrapped in all-inclusive packages. This reservations-only day resort is fun for the entire family. Experience the most exciting animal encounters any park in Central Florida has to offer. Swim with a pod of dolphins or spend time training them. Snorkel in a sea of tropical fish in Discovery Cove’s coral reef. Marvel at the miracle of flight and display of feathers in the free-flight aviary where you can feed hundreds of colorful birds. Aquatica®, a creation of SeaWorld® Orlando, is a whimsical, unique place. Float around the park and drift away into an exotic landscape. Dig your toes into the warm white sand beaches by the wave pools. Ride the glass tube slide that takes you safely underwater through a pod of black and white Commerson’s Dolphins. Aquatica® is truly its own style of family-friendly waterpark, which can only be found in Orlando. Walt Disney World Resort® is arguably what Orlando is known for world-wide. Plan your trip accordingly as there’s so much to do at the Walt Disney World Resort®. At Hollywood Studios®, meet your favorite Star Wars™ characters or watch an amazing stunt show featuring Indiana Jones. Tour replicas of cities from around the world and travel through time and space at Epcot®. Explore the African savanna and all its animals that live here in Orlando’s back yard at Animal Kingdom®. Discover the heart of all the magic and see the home of Mickey and Minnie Mouse at the world-famous Magic Kingdom®. The resort area is also home to two water parks, Blizzard Beach and Typhoon Lagoon, and a peaceful camp area named Fort Wilderness.